Grady Williams probably would not be able to live in his own home without Seniors Helping Seniors. “They help me do certain things I can’t do, like keeping the house up,” according to the 80-year-old New Hudson resident. In addition to helping him with cleaning and other chores, Kim Fischer also takes him to bingo and brings him puzzles that they do together. 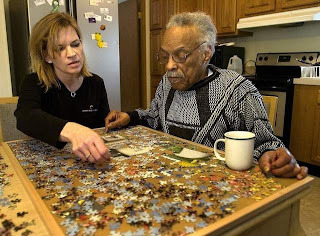 The concept behind the nationwide franchise is to link senior caregivers with seniors who need non-nursing help tailored to their specific needs to maintain a desired level of independence. Often, instead of going to a nursing facility, the client stays in their familiar setting and is able to keep their pets and all their belongings. “We provide seniors with the ability to choose an independent lifestyle in their own homes, for as long as possible, with the dignity and respect they deserve by finding caring seniors to help each other,” according to Lynn Albanelli, who co-owns and is partner with Jim Ludwig to provide Seniors Helping Seniors in west Oakland, Washtenaw and Livingston counties. Albanelli was a caregiver for Ludwig’s wife when she was dying a few years ago. On the giving end, Seniors Helping Seniors is for seniors who want to stay active; supplement their income and find other seniors who want to receive a service they can provide. “It is senior aged people who have the heart of a volunteer who want to help their peers stay in their homes,” Albanelli said. The character of the seniors providing services as well as the seniors receiving services is checked to help ensure the security and safety of all the people involved. Some of the services include providing companionship, homemaking, personal hygiene, 24-hour care, house repairs, medication reminders, bathing assistance, yard work, transportation, shopping, travel planning, respite assistance, Alzheimer and dementia care, as well as helping with pets. “We also approach it from a budget conscience approach,” Ludwig said. “There is no hour minimum. We try to set a plan of care that works around their needs and their resources. We’re willing to fill-in one or two hours or 10 hours here and there — whatever is required. We take people shopping or take them out for a drive. “The providers and receivers tend to grow to be very good friends,” he added. “Our care is provided to seniors in need, by seniors of the same generation. We often hear our receivers say how comfortable they are, because they relate so well with each other. “It’s a tremendous organization, and we hope to provide care to as many seniors as we can,” Ludwig added. “I was new to the area and wanted to get out of the house,” she added. “I got hooked up with Grady and you become friends with the people you take care of. I feel like I’m checking up on him and giving back to my community. And I do get paid. Seniors Helping Seniors was co-founded by Kiran and Philip Yocom 13 years ago. It grew from Kiran’s personal mission to care for those who are unable to care for themselves. Before coming to the United States from India, Kiran worked with Mother Teresa for 14 years. Currently, Kiran serves as the organization’s chairwoman and Philip is president/CEO. She also comes to the job with knowledge of where senior care can be improved. One client was depressed after losing his life partner. A Seniors Helping Seniors provider visited three days weekly to talk and try to help fill the void. Seniors Helping Seniors are also available to visit people in assisted living facilities if there is a need that is not being met. “Another woman just wanted someone there as a companion,” she said. “We match the providers with the assisters. They want to help the seniors in the community and make their lives easier. I have never met so many people who just wanted to help people. It’s amazing. Ludwig worked for 30 years as a landscape architect when his wife was stricken with a debilitating disease. Albanelli helped with her care. A few years ago Ludwig attended a franchise fair in Novi and he kept returning to the Seniors Helping Seniors booth where he learned there are 130 franchise partners in 35 states. “One thing led to another and I purchased a franchise,” Ludwig said. For more information, contact Seniors Helping Seniors at (810) 229-6400 or visit www.seniorshelpingseniors.com/owl.